Below you'll find a selection of projects we've taken on for various clients. Quixote Studios opened their NYC location and asked us to produce the event by bringing Hangry Garden to their location. We turned their parking lot into a fully operational venue with furniture, games, a bar, food vendors, music, a photo booth and the works. The Sports Center at Chelsea Piers is arguably the best gym in New York City. They offer a tremendous amount of amenities for their members including summer, sunset socials. 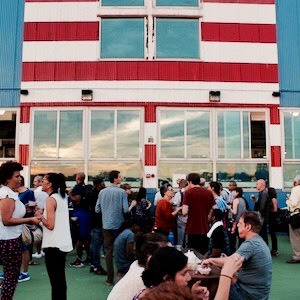 The Sports Center has been a loyal client of ours since 2016 and we've been curating their Sunset Socials with our event concept including furniture, games, bar and New York City's most popular mobile food vendors..
On July 17, 2016 we launched our Hangry Garden pop-up on the corner of N.8th & Driggs in Williamsburg Brooklyn. The pop-up was open 4 days a week and incorporated all the amenities we have to offer. From July through October we provided the neighborhood with a place they could hang out, eat, play games, dance and watch live music. It wasn't uncommon to see our guests spend up to 7 hours with us. Receive news and updates from Hangry Garden. We send updates every few weeks. We respect your privacy.